This business has $84,261 committed from 29 investors. Based in the small town of Sawyer in southwest Michigan, Fruitbelt LLC is a privately owned beverage development, marketing and distribution company founded in 2013 by partners Michele Gazzolo and Beth Denton, whose aim is to formulate, sustainably source, market and sell drinks made from ingredients native to American Midwestern orchards. Fruitbelt Sparkling Tonic sits at the confluence of trends: a concern for healthier food and drink, a growing interest and concern in regional/sustainable food cultivation, and a desire to be engaged with producers to create something delicious. Fruitbelt aims to address these concerns with a drink iconic of our history and fruit-growing traditions. We have brought to market a line of novel tart sparkling drinks made with pressed juice (each bottle containing 20-25% juice from American single-origin orchards), sweetened with organic honey and spiked with our own orchard bitters that highlight the botanics of the orchard. Fruitbelt is better-for-you, mid-calorie (60 calories), smaller format (8.5 oz/250 mL), free of colorants, fruit flavorings and preservatives (no artificial anything), and cold-pasteurized for shelf stability. We have a clean label. Our formulation efforts stem from providing something that is healthful, authentic and delightful; that is as conflict-free as possible; and that tells the story of the American orchard, from the dirt to the bees to the people who tend their crops. •	Cold-pasteurized for shelf stability and BPA Free. Tart Cherry contains tart Montmorency cherry juice from a Michigan orchard along with ginger extract and chicory root. Crisp Apple contains juice from the same Michigan orchard with extracts of lime, caraway and dandelion root. Our drinks will always be more tart than sweet in order to highlight the healthier anthocyanins and flavonoids that are contained in them. Our unique bitters highlight the botanics found in an orchard AND contain healthful qualities. We use botanicals that seem exotic, but are actually found in our back yards, like chicory and dandelion root, propolis from bees, aronia and heirloom apples. While the traditional CSD category continues to decline due to concerns over health, better-for-you NA beverages are expected to continue gaining share, especially those categories which contain some juice and identify as “craft”. There is ~$35 billion dollars in play by 2020 for these smaller brands in the overall NA beverage category. Juice-based craft soda is an emerging sub-category, in which only a few viable juice-based sodas are available. None originate in Michigan, only 2 hail from the Midwest, none use our cold-sterilization method of preservation and none offer a smaller glass packaging format. In addition to adding to the line-up of the full-flavored Fruitbelt people are growing accustomed to, we will introduce a branch off this line, a very low calorie (0-10 calories) botanical water. This line will be more bitter-forward and will contain native/unique juice extracts. Established in 2013, Fruitbelt conducted its first production run in January 2016 with a co-packer in Scranton, PA, with another successful production run in January 2018. Current product and operational status includes: Bringing a CEO on board effective January 1, 2019, a woman with impressive experience in Beverage/Food; 1 national distribution company (we are working out of 3 of UNFI's regional warehouses), 2 regional distribution companies, and 1 national re-distribution company; direct sales and self-distribution to local businesses; a VP of Sales with 35 years in the natural food/beverage category; 2 brokerage groups — one in retail (Greenspoon) and the other in food-service (Elohi); recent reformulation to improve COGS while remaining true to our brand; slight branding tweak to highlight premium quality of the drinks. Additionally, we completed Chicago’s Good Food Business Accelerator and have gained strong mentorship and introductions from our associations there. A one-time payment 2 months after investments close. A one-time payment 3 months after investments close. 3 monthly payments beginning 1 month after investments close. An orchard in every bottle! Fruitbelt addresses these concerns with a drink iconic of our history and fruit-growing traditions. We have brought to market a line of novel tart sparkling drinks made with pressed juice (each bottle containing 25% juice from American single-origin orchards), sweetened with native honey and spiked with a proprietary orchard bitters. Fruitbelt is better-for-you, mid-calorie (60 calories), smaller format (8.5 oz/250 mL), free of colorants, fruit flavorings and preservatives (no artificial anything), and cold-pasteurized for shelf stability. We have a clean label. We currently have 2 flavors: Bright Cherry Ginger and Crisp Apple Lime Caraway. These drinks can be purchased at select natural food grocery stores, on-premise pubs/restaurants/distilleries and independent grocers. The SRP from the cooler is $2.49/bottle. We have 4-packs available for placement on shelves as a stand-alone drink as well as a mixer for the home-cocktail enthusiast. The SRP for these: $8.99. We currently have key distribution partners in Michigan, Indiana, Ohio, Wisconsin, and Illinois. We have several self-distributed accounts within a 35-mile radius of Sawyer, MI. Fruitbelt entered the beverage market with two flavors -- Tart Cherry with Ginger+Chicory and Crisp Apple with Lime+Dandelion. We have another flavor lined up for a trial run late summer -- Elderberry with Elderflower+Propolis and Blueberry with Juniper. Other flavor possibilities for our original line of Sparkling Fruit Tonics include Wild Plum, Red Currant, Saskatoon, and/or Blackberries. Additionally, within the year we will launch our Fruitbelt Sparkling Bitters Waters! These are zero-very low calorie (no additional sugar or sweetening) and are more bitter-forward. In keeping with recent "comebacks" -- kombucha, switchel, shrubs, etc..., we believe bitters is the next comeback kid and are avidly preparing for that. Two flavors awaiting trial runs include Original (our local-exotic bitters+sparkling water) and Saskatoon-Aronia (saskatoon extract along with our local-exotic bitters and sparkling water). Since Fruitbelt owns its trademark in the alcoholic segment as well, we are seriously considering entering that space in the near future. There is significant opportunity for growth in this segment to make a “pre-mixed” alcoholic offering. There are very few offerings currently available – it’s really a wide-open space. We could use any of our tonics along with spirits from a local/regional maker as an example. This effort, of course, would require its own business plan along with projections. Michigan, inarguably, has great juice and orchardists. However, creating a drink using cold sterilization (as is prevalent in Europe) is not possible in our state. We looked for over a year for a Michigan production partner and came up empty. This realization led us first to an orchard in Maine that actually does have the cold-sterilization capability, BUT not the correct bottling line! We ultimately found our co-packing partner, CSD Co-Packers, in Scranton, PA. A renovated Coca-Cola plant managed by third-generation soda-maker Mark Fiorina (formerly of Boylan Soda), this facility has several bottling lines, equipment for the cold-sterilization process, expert technicians and a willingness to take on a smaller company in the start-up phase. In 2015, we conducted our first test run at this facility. In January 2016 we had our first production and in February of that year began selling our product. Since our production facility is located in PA and we're trying to minimize carbon footprint whenever possible while maintaining the customer's yen for supporting a company they can believe in, we take care with sourcing. 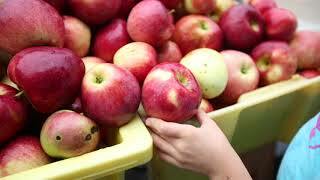 Our tart McIntosh apple juice and Montmorency cherry juice comes from King Orchards in Traverse City. Our unique Orchard Bitters uses flora from the orchard to create a delectable liquid, bringing in the story of the heirloom apple and bitter greens and roots -- exotics from our own yards! Believe it or not, there is no organic honey available anywhere in the US. We wanted to ensure the highest quality honey, while at the same time eventually going for non-GMO certification (only organic honey satisfies that group). We use TrueSource verified organic honey from the Amazon rainforest. What we've created is "An Orchard in a bottle" -- from the soil, to the trees, to the bees, to the plants, to the people who tend all this wonder! All of our ingredients have short timeframes in which to get them -- generally within a week. Once all the ingredients are in-house at the co-manufacturer, the drink comes together and is bottled within a few hours. In a world where healthy choices in a carbonated beverage can be difficult to find, Fruitbelt offers a refreshingly simple, almost storybook alternative: a wholesome, novel, not-too-sweet, festive and widely appealing drink made from ingredients that don't have to hide behind euphemistic language. Fruitbelt uses pressed juice from American orchards. It will always be tart and convey the richness of the orchard ecosystem. Currently, our drinks contain up to 25% juice, higher than any other American craft sparkling beverage. Our orchard bitters really are the heart and soul of Fruitbelt Tonics. The plants and roots used in our bitters bring the flora of the orchard front and center and highlight the delicate interdependency that exists there. Chicory, dandelion, propolis and aronia are some of the features of this wonderful aromatic and flavorful ingredient. The final leg to our value proposition is the novel packaging format. At 8.5 fl oz portion-size, Fruitbelt is the David to Goliath 12 oz bottles of conventional fruit soda which are standard in the land of obesity, many of which list calories and sugar according to an 8 oz serving size. Glass packaging provides insulation from the leaching of chemicals common to plastic or aluminum cans.